Ready for a sure-fire technique for hooking your readers? Want to make your messages more memorable? Would you like to start enjoying extraordinary results? Storytelling Toolkit delivers! 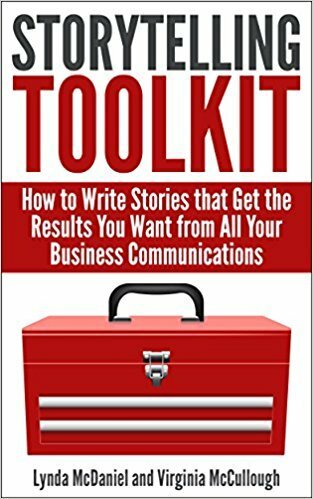 It’s filled with techniques and strategies designed to help you fill your books, blogs, and articles with attention-getting stories. Why tell stories? Stories get results! Our brains are wired for stories, and nothing engages readers more than anecdotes, examples, and case studies. By any name, stories are writers’ friend. Besides, they’re free because they’re yours! Trust us—whether you’re writing about growing a business, managing a department, improving customer service, raising a child, building a birdhouse, or pursuing better health and fitness, stories engage your readers and get your message across so much more effectively. And stories are more memorable, so your readers will remember your message—and you. Stories trigger emotion and reach the heart, where we buy and buy in. By bringing your work to life, stories are the secret to implementing the old, but still fresh adage: Show, don’t tell. Plus, you’ll learn how to dress-up your stories with creative techniques—similes, alliteration, and vibrant verbs. You’ll learn to wrap up your stories with a powerful “call to action,” so your readers know the next steps to their own success. Succinct and easy-to-use, Storytelling Toolkit will help you begin telling your stories today! Scroll up, buy now, and get ready for extraordinary results!